I’m super stoked about my gear. I feel like I’ve read every single review on every single model from every single brand that exists. I have an Excel spreadsheet that auto-sums the weight (in ounces and pounds) and the expense, sorted into category, sub-sorted into carried or worn, warm weather, cold weather, or both, and a separate column for noting the brand/model name. Y’all know what I’m talking about. I don’t have to tell you how satisfying it is to see all the pieces coming together. I am talking to my people. -Sleeping well and being warm. These go together for me. I have learned on previous trips that I sleep very cold and that makes me very unhappy. I’m not so much worried about being warm while hiking, more when in camp and sleeping. -Being lightweight: I weigh 103 pounds fully clothed. I simply can’t have a heavy pack. My goal was 25 pounds fully loaded with full food and water. I have done previous trips carrying up to 30 and it was…ok…but I can do better. -Manufacturer: I don’t have much brand loyalty, not because I dislike any brands but because I love them all. I think different companies are excellent at different things. I just wanted what worked best for me, and ended up with a good range of gear makers. -Price: It’s not that money is no object (see here for just how careful I am with money), just that I was prepared to spend a good amount and I wasn’t going to skimp on quality for a few bucks. It costs what it costs. 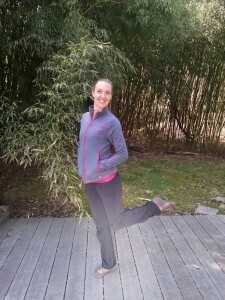 -Other peoples’ opinions: I absolutely considered product reviews and input from the good folks at REI when making decisions, but they are not me and ultimately only I know what works for the unique combination of human that I am. I appreciate feedback and suggestions, but please don’t tell me how wrong I’m doing something (if that’s how you feel). It’s simply not constructive. I won’t die out there. Everything else I have to figure out for myself. Mistakes might be made, and that’s ok, too. Pilgrim on the left, Jade on the right. This is going to be a game-day decision. I have my trusty internal frame Gregory Jade 40 that’s made it through some excellent miles with me, but I also impulse-purchased a frameless Gossamer Gear Pilgrim 36 as a weight-cutting experiment. I love them both. It’s a tight gear squeeze with the Pilgrim, but it’s almost 3 pounds lighter than the Gregory. If I can Tetris everything into the Pilgrim, that’ll be the winner. Gregory weight: 59 ounces (just shy of 4 pounds). Pilgrim weight: 21 ounces (1.3 pounds). 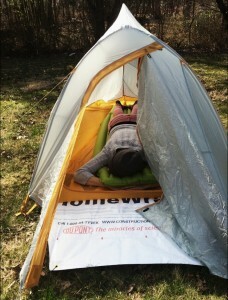 EDIT: I ended up with the Gossamer Gear Gorilla. It’s 40 liters- I just was not going to be able to fit everything into the Pilgrim. I think it weighs 25 ounces, still ultralight. Big Agnes Fly Creek UL1. It’s small, it’s light, and I think it’s being discontinued so I got it on sale. Rather than getting the manufacturer’s brand ground cover, I got a custom-cut Tyvek sheet with grommets on Amazon for $25. It’s lightweight and super durable and works juuuuuust fine. Total shelter weight: 38 ounces (2.4 pounds). 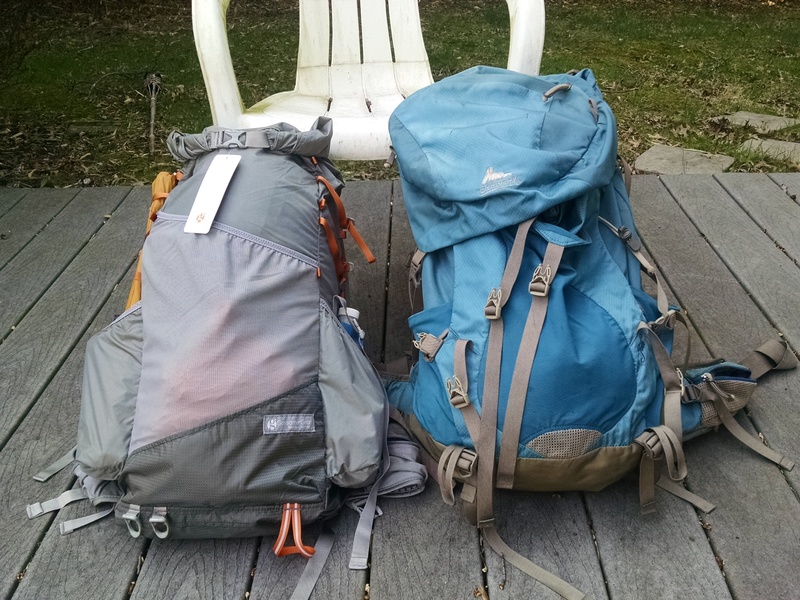 EDIT: I found some wiggle room in my budget and splurged on the ZPacks Solplex. It sets up with trekking poles, which I wasn’t planning to use, so I bought the tent poles to go with it. Total cost and weight: $618, 21 ounces. Also, after 50 miles of my thru hike, I bought $20 trekking poles at Walmart (my knees demanded it), so the total shelter weight should be sub-20 ounces now. This was a big one for me. Much money was spent and several test nights in the backyard helped me nail it down. Warm, cozy, and comfy. Nalgene for scale. Liner packs inside compression sack with quilt. I basically make a Nichole-burrito inside the red and black liner, on top of the pads, all wrapped in a soft taco quilt. Quilt pictured here upside down to show off fastening system. 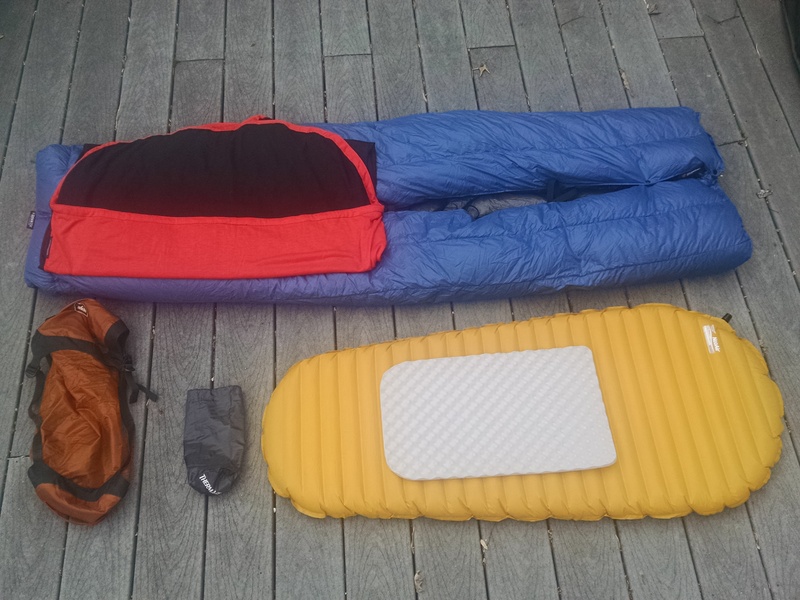 I’m going with an Enlightened Equipment 10* quilt (Short and Slim to save weight and money), a Sea to Summit Reactor liner (adds 20* to your sleep system for only 9 ounces), a Thermarest NeoAir XLite in short (it comes down to my thighs), and the foam pad from the back of the Pilgrim in the foot of the quilt. I can send home the quilt once it gets hot and just sleep in the liner. I’ll use a stuff sack with extra clothing for a pillow. Total sleep system weight: 42 ounces (2.6 pounds). Sawyer Squeeze Mini, Snow Peak GigaPower stove, Sea to Summit XPot-Kettle. I’ll also have a SmartWater bottle for dirty water. 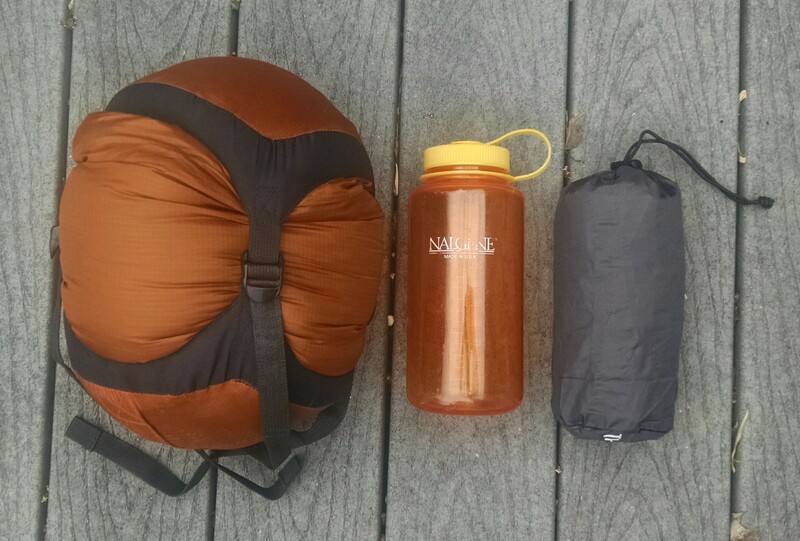 I find the Sawyer pouch infuriating to fill but way easier to squeeze, so I’ll use the dirty water bottle to fill it and then drink directly (via Sawyer mini) out of that. I bought an Ursack for food storage – they’re bear-proof so you don’t have to hang them, just secure to a tree. Total kitchen weight (excludes food and water, includes Ursack and 2 small fuel canisters): 34.8 ounces (2.2 pounds). I guess I like pink. For some reason, this is the category I struggled with the most. 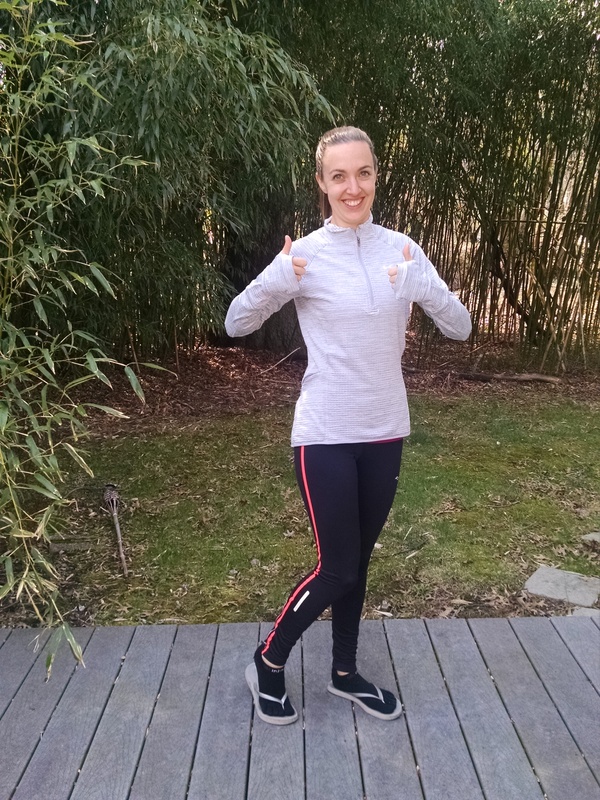 I want to be warm and comfortable, and have layers be multi-functional. Some of it is high-end, some not so much, but I’m pretty happy with and have field-tested it all. Probably send home the hat, Trekker pants, Arc’teryx jacket, and Mountain Hardware fleece once it gets warmer. Top row: Black Athleta trekker pants, Injinji liner socks underneath, light gray Nike half-zip, hot pink Arc’teryx Atom LT, black Saucony RunWarm leggings. Across the middle: Purple and pink Columbia jacket that is actually not coming, gray and pink Mountain Hardware zip-up fleece, Merrell low-top boots, REI hat, SmartWool socks underneath. 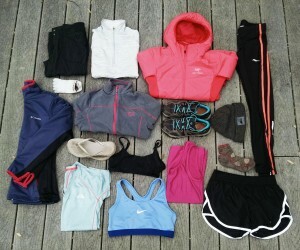 Along the bottom: silver rubber Old Navy flip-flops, powder-blue North Face t-shirt, Rugu and Nike sports bras, pink Ex Officio tank, C9 Target-brand running shorts. Total weight for all clothing: 61 ounces (3.8 pounds), but at any given time I’ll be wearing much of it or have sent it home. 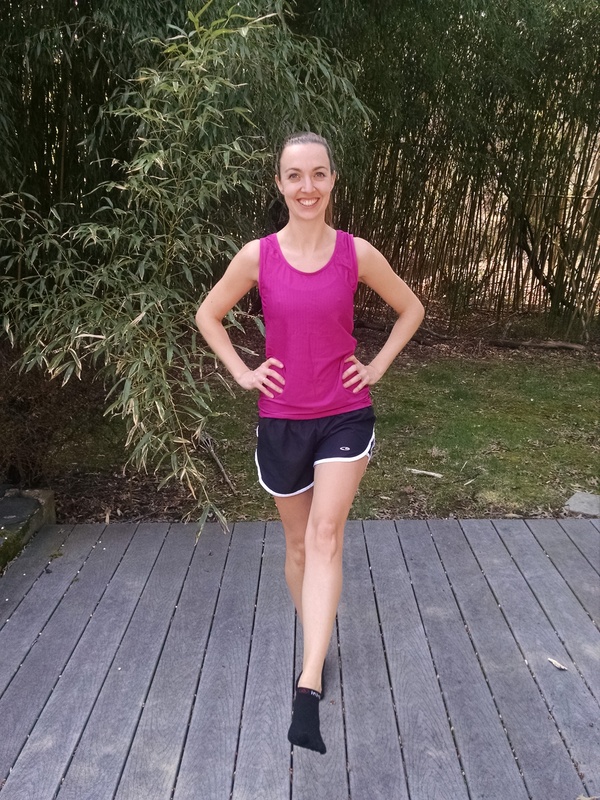 Ex Officio tank, C9 shorts, Injinji sock liners for hot weather. 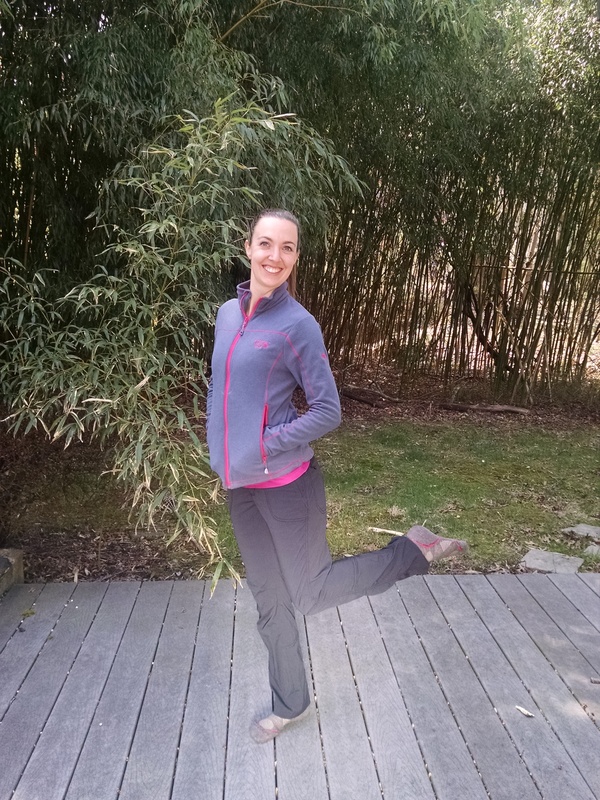 Add Mountain Hardware fleece, Athleta pants, SmartWool socks for cooler weather. 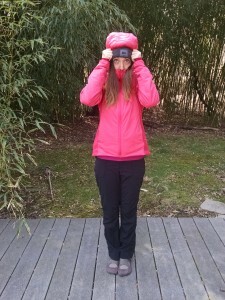 Throw on the REI knit hat and Arc’teryx Atom LT puffy jacket when it’s REALLY cold. Finally, warm and comfy clothes kept dry no matter what for camp and sleeping: T-shirt, Nike half-zip, and Saucony leggings, with cheap rubber flip-flops. Petzl Tikka X2 headlamp and extra batteries: 5 ounces. Plastic orange poncho with hood, big enough to go over me and my pack. Toiletries: glasses, contact case, lens solution, spare pair, toothpaste and toothbrush, small liquid soap (Dr. Bronner’s? ), comb, nail clippers, tweezers, disposable razor, Chapstick, plastic trowel, TP. First aid: Ibuprofin, Benadryl, Immodium, antibiotics. Leukotape, Neosporin. Maybe some wet wipes. Base weight (this includes everything listed above, if I carry the Pilgrim, wearing cold-weather hiking clothes, excluding food and water): 12.5 pounds. Throw in food and water and I’ll be right between 20-25 pounds. Through the use of some sales, discounts, and coupons, I’ve spent a total of $1,670 on gear. I had budgeted for $1500-$2000 so I’m pretty happy with that. I still have wiggle room to replace anything that doesn’t work, as well as buy a few more pairs of trail runners. EDIT: got the base weight down just under 12 pounds, for a total cost of a touch over $2000. OK, I think that covers everything! Questions are always welcome below if anything is unclear or you want details on the specs or cost or reasoning behind a particular piece of gear. Or, email at [email protected], and follow on the Instagram @nicholeyoung1 to see it all in action. If you don’t know this already run your tyvek in the washing machine without any soap and line dry it will still work perfectly but it will stop being soon crunchy sounding when you sleep on it. Yeah I had heard that! It only half-worked though – I used cold water, should I have used hot?? Not sure why you find a Sawyer Squeeze bag harder to fill than a Smart Water bottle. I find them equally difficult, so I fill the bag by scooping up water with a bottle with the top cut off. It’s good to have a back-up way to squeeze your water, though, if the bag breaks. You could use your dirty water bottle for that, if you make sure that the threads match up. Ahhh, it’s so tempting to re-think every single piece of gear! I picked a free-standing tent because that’s what I’m comfortable with, but I’m not opposed to a TarpTent, just unfamiliar! I have three weeks to commit… thanks for the input, I’ll check it out! +1 for TarpTents! I’ve used them on my AT and JMT hikes as well as all my section hiking adventures. I still have and use my first TarpTent from eight or nine years ago. Henry Shires makes great stuff and is an awesome guy to deal with. I met him after the JMT. He was kind enough to let me come to his house, set up a bunch of tents and even showed me a model in development. Thanks to REI’s epic return policy, I may still have time to swap… I’ll check it out! Please do not send your quilt home and plan to just sleep in the liner. I made that mistake when it was like 85° at Harpers Ferry. Then the weather decided to get cold again. I was even using a small fleece blanket with a liner. I think you want at least a 40° quilt. Maybe you could invest in one of those and send the liner and heavy quilt home when it warms up. And I wouldn’t carry extra batteries for the head lamp. Just buy some more whenever you notice your head lamp isn’t as bright as it use to be. 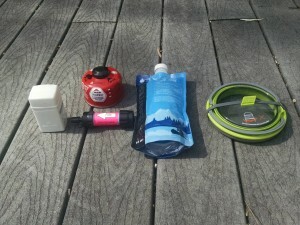 Zpak for tent soloplex, bag, and pack. Use gossamer gear adjustable carbon trekking poles. Nice water set up! I love your gear and your enthusiasm! Great picks! I’m looking at the Pilgrim as an upgrade as well. I also hate to make comments about other people’s things, but in regards to the Ursack- I would still plan on hanging it up high, maybe learn the PCT method as it is easy and you can do it on nearly any tree. Bears are frighteningly intelligent when it comes to getting at food! Good tip on the bear bag. It’s worth the extra effort to keep my food safe. Thanks for the encouragement! Great choices and write up. 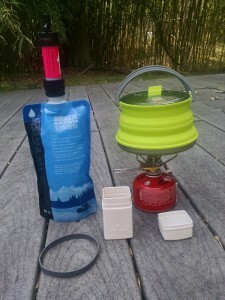 I have one thing to add if you are interested – I found the best way to get water into the Sawyer bag from difficult sources was using a good old ziploc bag. It really was perfect and easy to replace along the way. Good luck! Jade, that’s genius. I’ll try it! Thanks so much for including what clothes you will be bringing and how you will be layering! This has been a tricky for me as well. Best of luck!! Jillie, for some reason the clothing was the hardest part for me to nail down. Good luck, you’ll figure it out eventually! I thought your setup, thought processes in choices and start date were awesome. Happy Trails out there this year! 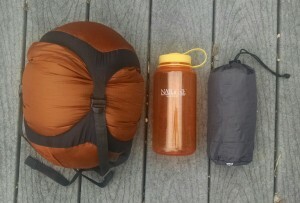 If you haven’t checked out ZPACK.COM I recommend it for tent (I second the soloplex), sleeping “bag”and pack. I’ve used them for years and have had zero negative issues. Their items will save a significant amount of weight. I looked at a pack from there but didn’t look at the shelters- now I will! Thanks! How did you manage condensation in the single layer tent? I’ve tried other tarp tents and always get too much condensation. Zpacks aren’t cheap and I’m hesitant to invest based on condensation. I’m looking at a Zpack Duplex. Unless I missed it, what are you using for rain gear? The atom is water resistant, but I’m wondering if resistant cuts it in a heavy downpour. Guess you could go with emergency poncho outside. They’re pretty light and easily replaceable if you tear one. Hey Scott! I have a cheap plastic poncho with a hood that I’ll throw over myself and my pack. 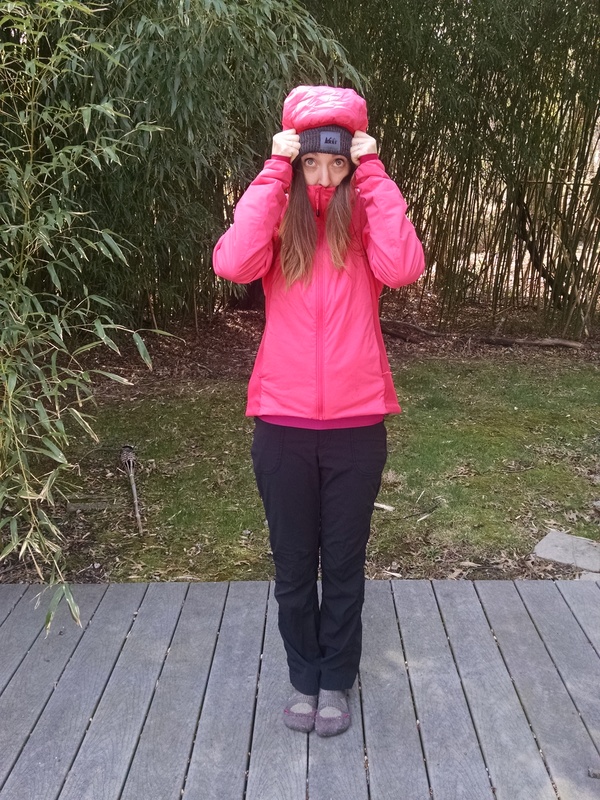 I tested it out during a 10 mile hike in heavy, cold rain and it kept my head, neck, core, and pack toasty and warm. It got snagged a few times on branches, but you’re right, they’re light and easily replaceable! Hi Nicole! Thanks for your post. I’m also small framed and don’t weigh a lot and have been trying to find UL women’s bags that will fit my 15″ torso length. What is your torso length, if you don’t mind posting, so folks know how to compare with how you felt with these backpacks?